The time has come. It is the dusk of autumn and winter months. I watch them from my window, flying towards the east. At first there are only a few; then they come in random patterns that grow in strength. It is always the same. There is a symmetry and dignified elegance to their flight, which is rooted in the inevitability of a long-standing tradition. Crows are returning to their roost. Since the 1970’s, an estimated 3,000 – 6,000 crows share a dusk-to-dawn abode that covers the area of about two city blocks in Burnaby, British Columbia. Forty years ago, trees were more plentiful, but the crows pay no mind to the urban sprawl that has reduced the foliage. This is their place and their numbers do not diminish. Scientists and bird-watchers are fascinated by the daily migration. Our generation is not the first to recognize the unusual characteristics of the crows, now believed to be among the world’s most intelligent animals. Over the centuries, crows, with their black plumage and startling caw, have garnered prominence in many myths and legends. In Irish mythology, the war-goddess Badb, takes on the form of a crow and joins her two sisters, Macha and the Morrigan to form the trio of war goddesses known as the Morrígna. The indigenous peoples of the Russian Far East revere Kutkh the raven spirit, appearing in their legends as a mighty shaman and trickster, similar to the indigenous peoples of the Pacific Northwest Coast. Three-legged crows appear in the mythologies of East Asia where they are thought to inhabit and represent the sun. In Chinese mythology, the sun crow is called Yangwu. Japanese mythology considers Yatagarasu, an eight-span crow, as a sign of divine intervention in human activities. In Korean mythology, the three-legged crow is named Samjok-o, a symbol of the sun and great power. 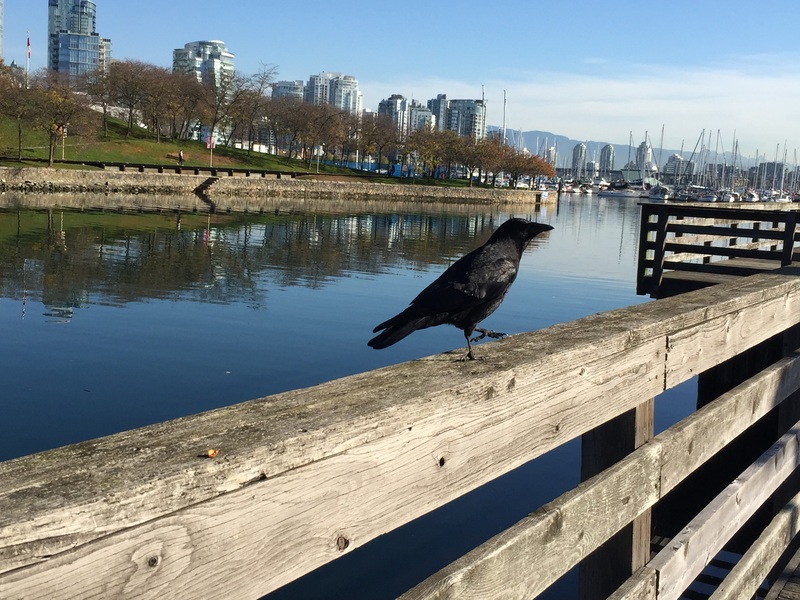 I walk with crows that share the pathway along the Vancouver Seawall. While they guard their territory with a proprietary determination, they have come to recognize my presence and agree to pose for my camera. I look forward to our conversations, and suspect that I am at the greater disadvantage. They seem to understand my language more than I do theirs. There is a bond between us, however. That is, the need for community and belonging. We seek the company of those we love and feel a kindred bond. Just as the crows gather in the fading light of a November evening, we look forward to the shelter and safety of homecoming. This entry was posted in Celtic, Crows, Indigenous, Japanese, Korean, Mythology, Russian and tagged Crows, Mythology. Hi Rebecca, hope you’re OK. I love crows and the crow family, such intelligent and innovative birds, I’d love to see the gathering of so many. Thank you so much for adding to the dialogue, James. The more I learn about crows, the more amazed I am by their brilliance. I am convinced that we have underestimated the intelligence of our fellow creatures that share our world. Crows not only recognize faces, they remember them. They are able to communicate with each other and share information. I read that some experts believe the crows have regional dialects. Amazing! All is well on my side of the world – hope all is well on your side! Take good care, my friend!! Without a doubt the crows know you and recognize you as a friend and companion. What a wonderful comment to read! Thank you, Gallivanta! Today, I stopped by and spoke to crow in a different area of the city. What I found interesting was that he stayed close to me as he ate his dinner. When I first started walking the Seawall (about 5 years ago) the crows flew quickly away. Things are different now! What a lovely celebration of the crow! They do not usually attract much positive attention here in the UK as far as I know so this will make me look at them in a different light! What a fun and interesting article!! I didn’t know about the crows arriving in Burnaby–and so many. The mythology is interesting and from so many parts of the world. I have always thought that crows and ravens have a dark side, but it would seem that many have thought that they have a special knowledge. Back in the days on the farms their “caws” always seemed like they were scolding us or telling us to be “on our way”. Interesting that they should be known as the world’s most intelligent. They are truly an example of family and community–how beautiful. From my research into mythology, ravens (crows) are perhaps one of the most popular birds in myths and legends. Crows and ravens are featured in many creation stories. But what I found most interesting was their depiction as a trickster. And they do indeed have a dark side, probably because they feed on carrion. Even so, mythologies recognize the intelligence and wit of this bird. You would really enjoy the conversations that occur between the crows, pigeons, ducks and geese. A couple of days ago, the crows gathered together over a large tree. Their agitation was intense. All of a sudden a large crane came out of the treetop and gracefully flew away, much to the rejoicing of the crows. I can see why people go into bird photography. Its entering a new world; and if you are very lucky, you get an invitation. Coincidentally I received your new post when a few minutes ago I’d just read a passage dealing with a raven, (very big crow so to speak) in Joseph Boyden’s wonderful book, The Orenda. As your post opens with Matsuo Bashö’s ‘On a bare branch a crow is perched – autumn evening, it perked my interest due to my own interest in crows, about which I have written quite a few poems. I have taken the liberty of including this last, rather sad side of life, short poem, which is in my book #12, “A Scent of Reality” to be released officially in a couple of days. But alas will be no more! Oh Jean-Jacques – this is a wonderful and brilliantly constructed poem. Perfect for this time of year – autumn, when the light grows weak and the nights cold. There is a reverence to the words “To find a place Said be last chore.” It seems that our lives are about “finding a place” even at the last – which to me, is my definition of homecoming. Congratulations on your 12th book! I am celebrating with you. Thank you so much!! I’ve been practicing my crow caws lately – it seems to be working! Caw Caw Caw! Thank you, Aquileana, for your encouraging thoughts. I love crows and can see why cultures have embraced them within their mythologies. I have enjoyed following your blog for it has given me great insight into mythology. Even within our age of technology, we have a deep need to connect with our earth and fellow creatures. Mythology provides that link. I like the quote by Thomas Bulfinch: “Without a knowledge of mythology much of the elegant literature of our own language cannot be understood and appreciated.” Have a wonderful day! I have a profound connection to crows. They give me messages in my dreams. I sense a strong connection to the crows as well. It seems that we share a “mythology” that spans the human experience. When I lived in Northern Canada, I was drawn to the huge ravens that would congregate in our back yard. They were absolutely magnificent. Your comments are so very much appreciated. Beautifully said Rebecca and in tune with Basho. Thank you so much for your affirmation. These past few months when I have revisited the narratives of mythology, I have come away with a keen sense of gratitude that I am a participant in the story of humanity. And that story is not complete unless we are connected to our earth and all creatures that share our journey. Wasn’t he handsome!!! He was rather hesitant at first, and then when he realized I didn’t want his breakfast, he allowed me to come closer. As I write these comments, I see a couple of crows heading east to their roost! In a couple of hours, more will come. They are fascinating creatures.